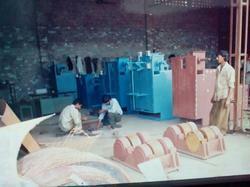 Our organization is engaged in manufacturing and supplying a quality range of Flat Belt Conveyor. These Flat Belt Conveyors are specifically designed using high-quality metal and alloys, providing sturdiness to the structure. Available in various specifications, our range comprises belt conveyors including trough belt conveyors, flat belt conveyors, inclined belt conveyors, portable belt conveyors and movable belt conveyors. We are instrumental in manufacturing and supplying a wide and qualitative range of Belt Conveyor for Material Handling. 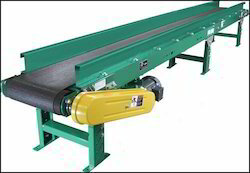 Belt conveyor technology is used in conveyor transportation such as moving sidewalks or escalators, as well as on many manufacturing assembly lines. 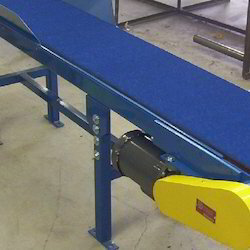 We manufacture these belt conveyors using optimum quality material keeping in mind the requirements of clients. Our Material Handling Conveyors are mainly used for construction purpose for treating long and/or flat components. 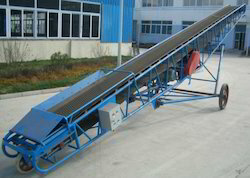 Material Handling Conveyors includes screw conveyor, belt conveyor and bucket elevator etc. Highly efficient blast wheels fixed on the industrial conveyor system housing make it possible to treat the components on all sides. We are one of the well-known manufacturers, exporters and suppliers of Material Handling Equipment The offered Material Handling Equipment is very widely used for the grinding of iron ore. Our supplied Material Handling Equipment is highly acclaimed and appreciated by the clients, owing to the hard wearing design and sturdy construct.